Also serving communities of Colonial Heights. There are 12 Assisted Living Facilities in the Petersburg area, with 8 in Petersburg and 4 nearby. To help you with your search, browse the 37 reviews below for assisted living facilities in Petersburg. On average, consumers rate assisted living in Petersburg 3.7 out of 5 stars. Better rated regions include Hopewell with an average rating of 3.9 out of 5 stars. Caring.com has helped thousands of families find high-quality senior care. To speak with one of our Family Advisors about assisted living options and costs in Petersburg, call (855) 863-8283. The Petersburg, Virginia, area has a rich history dating back to the town's founding in 1748. Today, seniors living in Petersburg may enjoy visiting one of the city's impressive array of historical parks and museums. 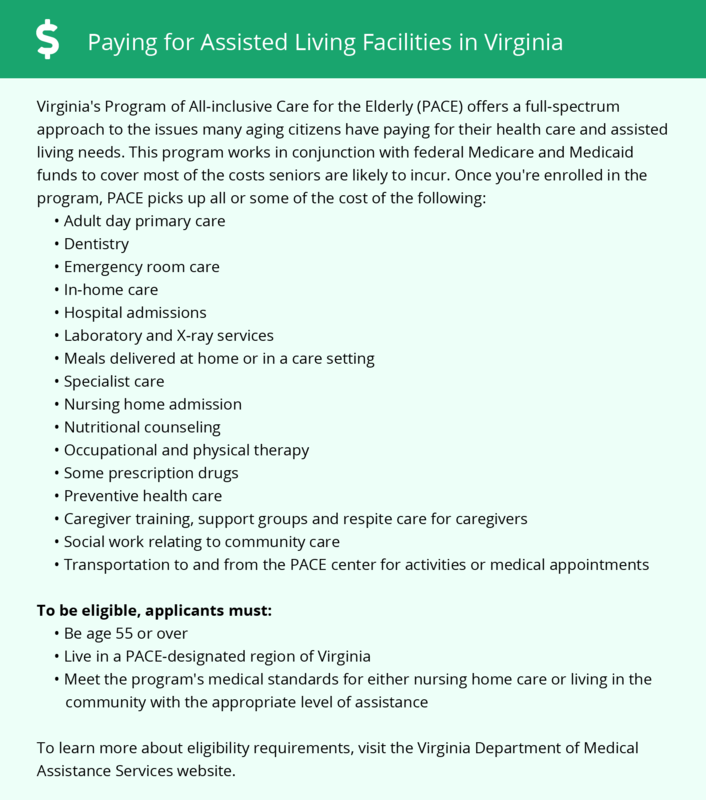 For those seniors and their families who are considering assisted living, Virginia's Department of Social Services licenses 17 different Assisted Living Facilities (ALFs) in the Petersburg area, including eight in Petersburg and nine more in neighboring communities like Williamsburg, Franklin and Richmond. In Petersburg and throughout Virginia, facilities that provide a minimal level of care are called residential living care, while those that provide more intensive services are known as assisted living care. Assisted living communities in the Petersburg area may offer their senior residents outings to local parks, landmarks, shops and museums. Notable attractions include Pamplin Historical Park, Petersburg National Battlefield Park and the National Museum of the Civil War Soldier. Petersburg is more affordable for seniors than the average American city, with a cost of living that is 9.2 percent below the national average. The climate in Petersburg is reasonably mild compared to other U.S. cities. Seniors living in Petersburg can expect humid summers and winters with lows in the mid-20s. Petersburg Area Transit (PAT) serves the city's public transportation needs. Curb-to-curb transportation is available to seniors who qualify under the Americans with Disability Act. PAT offers paratransit services to Petersburg residents aged 70 and older at half price. According to the American Lung Association, Chesterfield County gets passing grades on air quality measures — a B for high ozone days and an A for 24-hour particle pollution. Seniors and their families should be aware that crime rates in Petersburg are significantly above national and state averages for both violent and property crimes. Across the country, 92 percent of cities are considered safer than Petersburg. Assisted Living costs in Petersburg start around $0 per month on average, while the nationwide average cost of assisted living is $4,000 per month, according to the latest figures from Genworth’s Cost of Care Survey. It’s important to note that assisted living rates in Petersburg and the surrounding suburbs can vary widely based on factors such as location, the level of care needed, apartment size and the types of amenities offered at each community. In 2018, Virginia replaced its old Medicaid waiver programs with a single program called Medicaid Commonwealth Coordinated Care Plus (CCC Plus). Seniors in Petersburg who believe they may qualify for long-term care assistance are encouraged to contact their local services board for more information. Petersburg and the surrounding area are home to numerous government agencies and non-profit organizations offering help for seniors searching for or currently residing in an assisted living community. These organizations can also provide assistance in a number of other eldercare services such as geriatric care management, elder law advice, estate planning, finding home care and health and wellness programs. To see a list of free assisted living resources in Petersburg, please visit our Assisted Living in Virginia page. Petersburg-area assisted living communities must adhere to the comprehensive set of state laws and regulations that all assisted living communities in Virginia are required to follow. Visit our Assisted Living in Virginia page for more information about these laws.